There was much to appreciate along today's route but the highlight for me was revisiting Black Sail Hut. 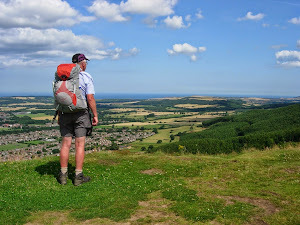 It brought back memories of last year’s Coast to Coast Walk and in particular my Day 2. It had rained all the way from Ennerdale Bridge that day in August last year and by the time I arrived at Black Sail Hut I was soaked to the skin. Today’s was better weather so we and the Coast to Coasters resting and arriving there at lunchtime were in a much better state than I had been. Although, it being the Coast to Coasters’ Day 2 also, some were .. err.. edgy? Inner battles and second thoughts perhaps, about what they had let themselves in for. Hee hee. 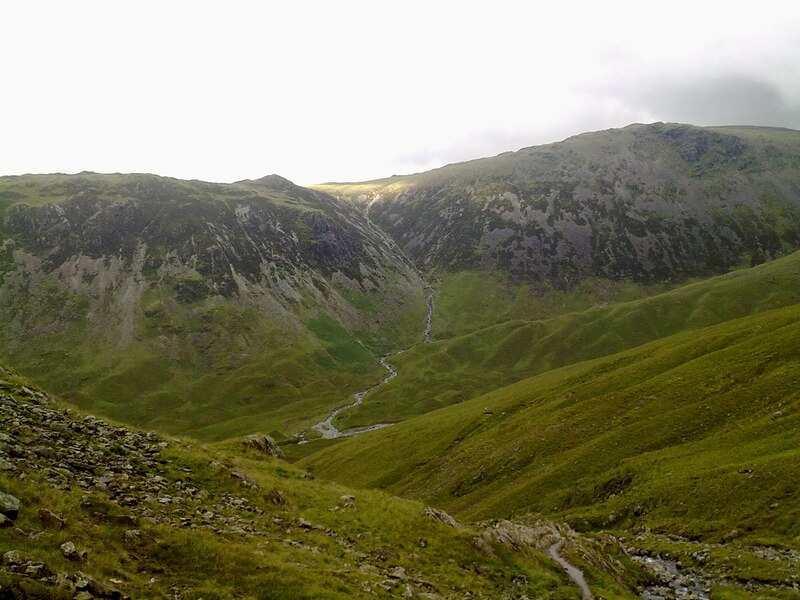 Climbing up to Black Sail Pass was hard work for me but with Buttermere behind me, spirit was rising as well as the body. 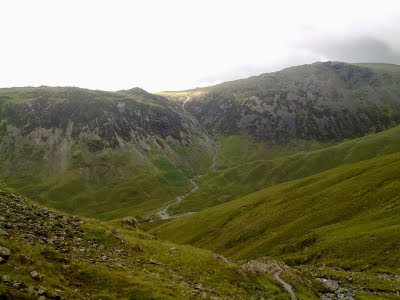 The brief halts to catch my breath enabled me to track the Coast to Coasters in the valley below heading toward Black Sail Hut and those nearer Loft Beck making their way up (puffing) to Honistor Pass. Double Hee hee. We arrived Wastdale Head in fine weather to be greeted by the cheerful, helpful staff of The Wastdale Head Inn, Jennings Cumberland Ale, Cumberland Sausage, mashed potatoes and vegetables. 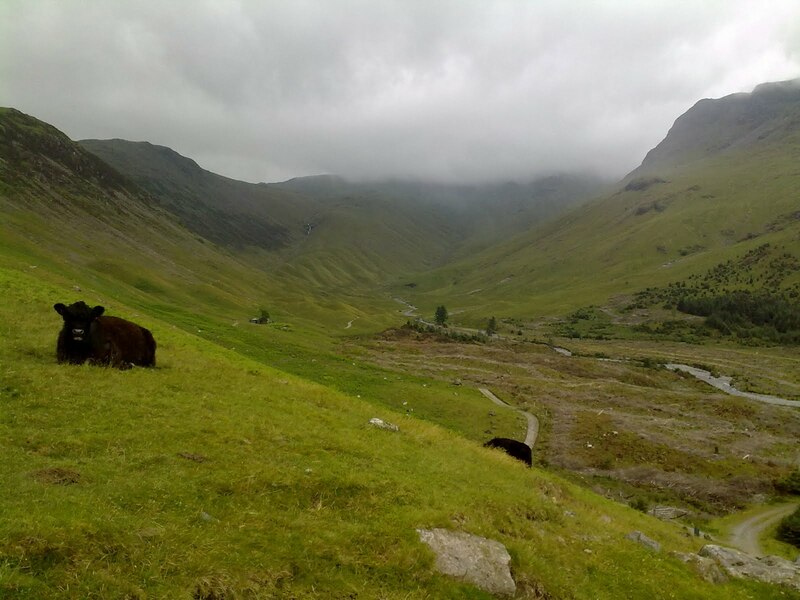 Buttermere Bridge Hotel Wallahs should take a hike - to this valley. Treat the Thursday night/Friday morning crew here properly, and learn. True. But knowing that there'd be good company, and hot water for a brew (and noodles) at the YHA hut, the descent was not foremost in my mind.